Press Release (ePRNews.com) - BUSINESS BAY, UAE - Oct 11, 2017 - ARTIANA, UAE’s first and only home-grown auction house for art and luxury collectibles will be holding its sale of Classical, Modern and Contemporary paintings from the South Asian region. The sale features 10 lots of Indian classical paintings and 50 modern and contemporary paintings. It will open for bidding from October 26, 2017 6:00 pm UAE time and will close on October 30 between 6:30 – 9:00 pm. 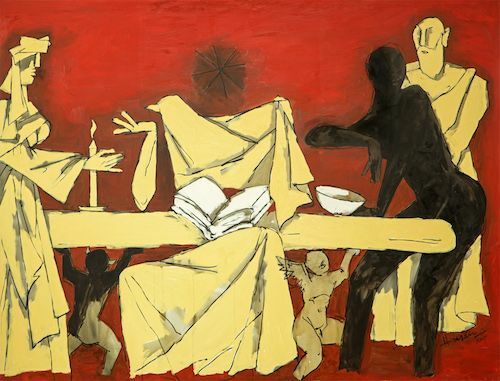 The sale is led by a seminal work by one of India’s important modernists MF Husain. The painting is based on ‘The Last Supper’ and presents a rare opportunity for any collector to acquire a significant work of this artist. The work is the pivotal feature of The Lost Continent series. Painted in July 2005 in London, the series gives an insight into Husain’s sense of humanity and moral values. It was sold for USD 2 million in 2005 and, at the time, bore the record of the highest sum ever paid for a work of modern art from India. Apart from this, the sale comprises of paintings by artists such as FN Souza, Rameshwar Broota, Manjit Bawa among others including a collection of Indian classical paintings. ARTIANA is a hybrid auction house mfns that has redefined and streamlined the auction process with its No Buyer’s Premium policy. It offers the clients the important elements of the traditional auction house services such as expertise, viewings and printed catalogues desired by many art collectors sans any Buyer’s Premium usually charged by other auction houses thus resulting in savings to our clients in the region of 30% of the winning bid amount. Our USP slogan “What You Bid Is What You Pay”. Prospective buyers can view the works in ARTIANA’s viewing gallery in Downtown Dubai by prior appointment. Registration for the auction can be completed at www.artiana.com or through their mobile app available on both Google Play for Android and the App Store for Apple devices. ARTIANA conducts the auction process online on its proprietary auction application software, and distributes both online and physical catalogue for every auction. ARTIANA is founded by Lavesh Jagasia, an expert with three decades of professional experience in the sphere of Indian Art. He is a specialist in Modern and Contemporary South Asian Art and has collaborated with most of the leading South Asian artists on various projects.